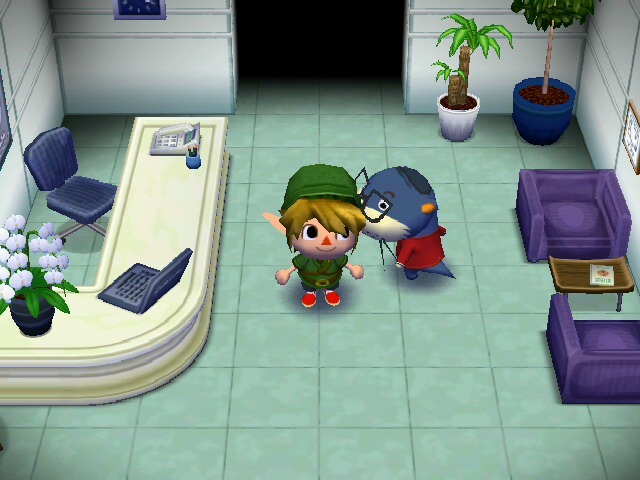 The Happy Room Academy, or HRA for short, is an organization that rates and reviews your home and your villagers' home. To sign up for the HRA, go to the city and head into the building between the Marquee and GracieGrace. The building is open from 9am to 9pm. Talk to Lyle, the person who runs the HRA. He is depressed, so you might hear a long, boring speech about how he hates his job. If you choose to sign up, you will receive a letter in the mail every Sunday. The letter will say how many points your home is worth and the status of your home. This is the only time you can see the academy paper. Your attic and basement do not get included in the rating. If you are connected to WiiConnect24, he evaluates all of the houses in town for every connected player, so now you have some online competition going on in the model room. Walk in the back of the HRA HQ and you will find the model room. Lyle and the HRA hold a contest each week to see which player's town has the best looking room based on a certain idea. This idea can range from the furniture theme to the feug shui layout. (See ACC's Feug Shui guide for more details on that.) Whichever room wins gets to be on display in the HRA's model room. If you enter the model room, you can press A on any item and it will tell you the name of that item. The model room can give you tips on decorating your home. Another way to gain points is to complete the series, set, or theme. To gain even more points, you can have the matching flooring and wallpaper too. • You earn 20,000 points for placing all 10 pieces of furniture in a room. • You earn 25,000 points for placing all 10 pieces of furniture in a room, including the flooring and wallpaper. • You earn 30,000 points for having the complete series, including the flooring and wallpaper. Good luck with your home! If you follow this guide, I'm sure the HRA will praise you for your decorating skills!